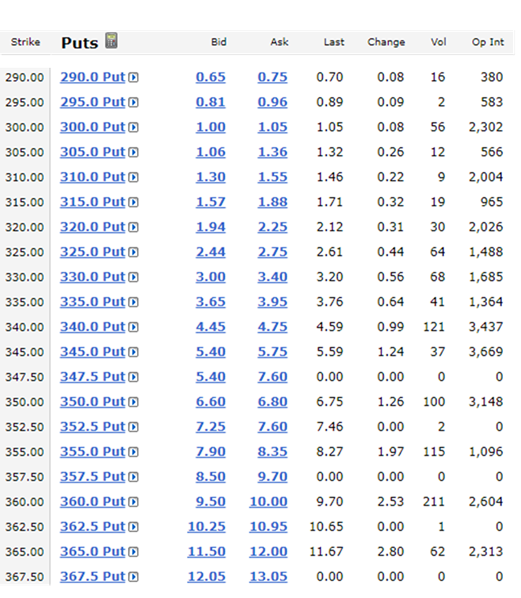 Sell PUT Options on Boeing (BA) with a strike price of $340 (8.6% out of the money), and expiration date of April 18, 2019, and for a premium of $3.70. That’s an extra 13.1% income on an annualized basis (3.70 / 340) x 12 months). And if the shares get put to us before the options contract expires then we're happy to buy the shares of this blue chip dividend powerhouse at the lower price of $340. And if the shares don't get put to us, we still get to keep the extra income we generated no matter what. We believe this is an attractive trade to place today and potentially tomorrow as long as the price of Boeing doesn't move too dramatically before then, and as long as you’re able to generate annualized premium (income for selling, divided by strike price, annualized) of approximately 10%, or greater. The premium income available on Boeing put options is high and attractive because the market is fearful following last week's news of a second deadly Boeing 737 MAX plane crash in 5 months, one in Indonesia and one in Ethiopia. And while multiple countries have grounded the planes, the Wall Street Journal reported over the weekend that the Transportation Department has opened an inspection into the Federal Aviation Administration's ("FAA") approval/review of the 737 MAX planes. Again, all this uncertainty and fear is creating higher income availability in the options market (specifically, income for selling puts). "After assessing the potential costs to the firm, we are placing a $2 billion contingency in our model, but we are not changing our 2019 forecast. However, this results in only a 1% decrease in our fair value estimate." The shares have already fallen more than 15.0%! And even if we're wrong about how much more the shares could fall, we still get to keep the attractive premium income for selling these puts, and the shares won't get put to us unless the share price falls significantly further. And oh, by the way, Boeing is an enormously profitable business with gigantic cash flows, and an amazing backlog of orders that they will deliver (and get paid a lot for) in the future. If you don't know, Boeing makes commercial airplanes (~70% of sales) and military defense equipment (~30% of sales), and they have an enormous backlog of future business (~5,900 planes) which provides long-term visibility into future success. Demand for planes (and leasing of planes) makes Boeing a juggernaut of a business. For a little more perspective, Wall Street analysts still recommend buying even after the latest news (the second crash was reported March 10th), as you can see in the following chart. Two important considerations when placing options trades are upcoming earnings announcements and dividend dates because they can increase volatility and dramatically impact the value of your options contract in unexpected ways. However, in the case of Boeing, they're not expected to announce earnings again until April 24th (just after this option contract expires), and the shares won't go ex-dividend until late April/early May (also after this options contract expires). For Boeing the dividend and future earnings announcement are largely moot points--a good thing. If you're going to place this trade, you'll need to keep enough cash in your account to cover the cost of the shares if they do get put to you. Options trade in lots of 100, so you'll need too keep a lot of cash on hand for this one since Boeing's share price is relatively high. The other alternative, if your account is approved for margin, you don't need to keep the cash on hand, but if the shares do get put to you then you'll buy them with borrowed money (on margin), and there is a cost to that (currently around 2.7% annual interest charge at Interactive Brokers, for example). Boeing is a powerful blue chip company that pays a healthy dividend, and its products will continue to be in high demand for many years to come (as evidenced by its 5,900 plane backlog and high industry demand). We believe the market has over-reacted to recent news, and that's why the shares have sold-off as much as they have, and it's also why premium income in the options market is attractive (premium income goes up as fear and volatility go up). Even if we're wrong, and the shares of Boeing fall significantly further, we've got some cushion built into this trade considering the strike price is significantly below the current market price. We'd be happy to buy the shares of Boeing at the lower price, and we're happy to keep the premium income on this trade, no matter what.